The solitaire diamond engagement ring evokes timeless elegance, but designer jewelry houses have cooked up more trends this year that elevate these rings to a new level. A combination of novel prone settings, air of sensuality, and contrasting colors, among others, set the benchmark for the most beautiful engagement rings today. In our case, we just need one defining factor measured by our drooling curiosity: the sparkling, spellbinding, absorbing price of these ten diamond engagement rings that we couldn’t get our eyes off. It’s the thought that counts, we know, but we wonder what sort of thoughts were going on in the minds of these women when their fiancés opened the box to reveal one of these lovely rings inside. How about $2.5 million? That’s 10-carat diamond ring that Michael Douglas choose to fit right on the finger of Catherine Zeta Jones. But it’s not all price, really. As far as surprising costs go, the “cheapest” of the most expensive rings in our list belongs to Kate Middleton, the Duchess of Cambridge. It’s only about $137,200. Prince Williams is not scrimping on her for sure; rather, the ring belongs to his mother, Princess Diana, who wore the same piece after agreeing to marry the England’s heir to the throne decades ago. It’ definitely a successful strategy to give such a jewel to your loved one. Well, money can’t buy you royalty, but it can buy you to the top of our list, which was what Richard Burton must have been thinking when he gave his ring to Elizabeth Taylor. How much is it worth? Let’s just say it’s worth more than Beyonce’s ring that’s on spot no. 2. 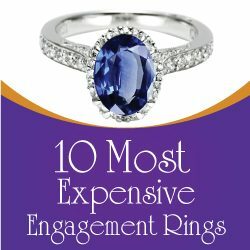 Gerard 18-carat Blue Sapphire-White Diamond Engagement Ring This was given to Catherine Elizabeth “Kate” Middleton, Duchess of Cambridge by Prince William, Duke of Cambridge and is valued at £85,000 or roughly $137,200. It’s the same engagement ring worn by the Prince William’s late mother, Diana, Princess of Wales, when she got engaged to Prince Charles of Wales in 1981. The sapphire is fringed by 14 tiny diamonds and was valued at $45,000 at that time. It’s not unique or extravagant by royal standards but has become priceless because of the drama surrounding the Diana. It is among the most famous engagement rings ever. Argyle Jewelers Pink Pear-Cut Engagement Ring This was given to Anna Kournikova by fiancé Enrique Iglesias and is valued at $2.5 million. It’s a pretty yet sophisticated 11-carat natural pink pear-cut pink diamond at the center, with two Trillian stones on the side. Fred Leighton Vintage Diamond Engagement Ring Given to Catherine Zeta Jones by husband Michael Douglas and is valued at $2.5 million. It’s been described as a gorgeous vintage, marquise-shaped, 10-carat diamond set horizontally. The ring has a vintage 1920s vibe, with 28 smaller stones sparkling around the large diamond. Lesotho III Diamond Engagement Ring This was given to Jacqueline Onassis by second husband Aristotle Onassis and is valued at $2.6 million. It’s a Lesotho III 40.42-carat diamond ring and was one of only 16 cuts from a 601-carat rough diamond discovered in South Africa. This was worn by Jackie O. only twice and always remained locked in a bank vault in New York. Graff Emerald-cut Diamond Engagement Ring Given to Melania Knauss by husband Donald Trump and valued at $3 million. It’s a 15-carat emerald-cut diamond ring on a platinum basket setting, bought from the House of Graff in London. The diamond is flanked by baguettes, or leaf-like designs. Neil Lane Blue Diamond Engagement Ring Owned by Jennifer Lopez and given by ex-husband Marc Anthony this ring is valued at $4 million. The ring has a dazzling 8.5-carat diamond as its centerpiece, stunningly mounted on delicate metal by Neil Lane, jeweler to the stars. It is considered the rarest and most prized jewel in Lopez’s heap of bling. Cartier Emerald-Cut Diamond Engagement Ring Given to Grace Kelly by husband Prince Rainier of Monaco, it is now worth $4.06 million. The official engagement ring of this fairytale romance has a legendary Cartier 12-carat emerald-cut center, flanked by two stylish diamond baguettes. White Gold, Diamond-Encrusted Engagement Ring The Paris-Paris romance that captured the world’s imagination was marked by this engagement ring to Paris Hilton by ex-fiancé Paris Latsis. Yes, it didn’t have a happy ending. The ring is valued at $4.7 million. It is a massive 24-carat white gold ring with a centerpiece rectangular diamond, flanked by two triangle cut baguettes. It was so huge the hotel heiress said it hurt her finger. She later auctioned it for Katrina hurricane victims after their split. Lorraine Schwart Platinum Diamond Engagement Ring Beyoncé got this $5 million ring from husband Jay Z. It’s an 18-carat flawless octagon-cut diamond ring set in a platinum split base and was designed by jeweler Lorraine Schwart. The $5-million rock has been certified as an exceptional, internally clear, premium stone. Read more: Most Expensive Musical Instruments: Eric Clapton's Guitar, Violin or a Steinway Piano? Asscher-cut Krupp Diamond Engagement Ring Elizabeth Taylor was given this $8.8 million by Richard Burton (twice her husband, in 1964 and 1975). It features a huge 33.19-carat Asscher-cut Krupp diamond with a fairly large culet facet. It is certified as a Type IIa diamond, the most chemically pure type of diamond with exceptional optical transparency. Christie's auctioned the engagement ring in December 2011, and was acquired by an unnamed Asian collector. You should have put Kate’s ring at the top of the list. It’s priceless! That means not even Elizabeth Taylor’s bling can match that. Nice material, by the way. Obviously, nobody has control over such things, because this is about true value. The only down side, Liz Taylor’s would draw a high value, because it would have been purchased in 1963-64, and the value is based it’s assessed value at the time of the auction in 2011, long after one of the most well known actress’ had passed. Liz Taylor memorabilia would be worth more just because of her name. But Princess’s Kate’s ring is a blue sapphire, and the rest are more expensive and rare diamonds. I hope all these rich people are wearing or had worn their ring all the time. It’s a pity if they just put it in a vault or some safe place. It defeats the real intention of engagement rings. Very nice list. Very inexpensive if you factor in the age of the diamonds. Over 3 Billion years! I wonder how these rings were evaluated for their worth. Diamond valuation is still as varied as the relationships in this infographic that’s why if you’re buying diamonds as an investment, good luck with finding the right price. I think much of the worth in these rings are attributed to the fact that they’re worn by celebrities. People think diamonds are rare. The top diamond mining companies act like the oil companies. They control the market outflow of diamonds to create an artificial demand. I bet there are more than enough diamonds for all of us in a vault somewhere someplace. Ellie, many people are confused about the value versus the demand. The total amount of diamond bulk in the world is not the basis for the price. The value of a diamond is based on the physical weight, cut, clarity and color. You can find a diamond with very poor color, clarity and bad cut for pretty cheap, but many people try to sell them for expensive because uninformed consumers or they simply just take the word of one or two individuals. Diamonds are naturally large crystals or rocks. The rarity of a diamond that is perfectly clear in color, with no internal inclusions (small defects that form in crystals, often confused as cracks) or Diamonds that a jeweler was able to cut to the perfect proportions (which is much harder than people think)… Those are so rare, they do have a higher demand… to have a large (bigger than 8mm wide or greater) is so rare, many insurance companies refuse to insure, because they simply can’t replace. Colored diamonds, also known as Fancy, are low grade, but uniform coloring is also rare. Diamonds are actually not one of the greatest investments, because unlike precious metals, their price is not so much based on their bulk. American Gem Society has some nice work on the subject, real educational stuff for consumers. There’s nothing wrong with giving an expensive engagement ring. It’s only wrong when you can’t afford it and you max out your card for it. That’s a liability that ironically will ruin your marriage soon. Sorry your source and info about Jacqueline ring is wrong the emerald and diamond ring was offered by John Kennedy and not Onassis.